The San Jose Blog: Downtown San Jose Walking Tours Return this Weekend! Downtown San Jose Walking Tours Return this Weekend! This weekend enjoy a great opportunity to discover some of the unknown stories of San Jose and also support San Jose Walks & Talks, whose aim is to help students uncover some of their hidden talents as they prepare for their future careers. This Saturday our one-hour Adobe to Adobe walking tour will start from the Peralta Adobe in San Pedro Square and visit some well known and some unknown downtown sites. Along the way student-guides tell some of the historic, funny, tragic and surprising stories of San Jose. 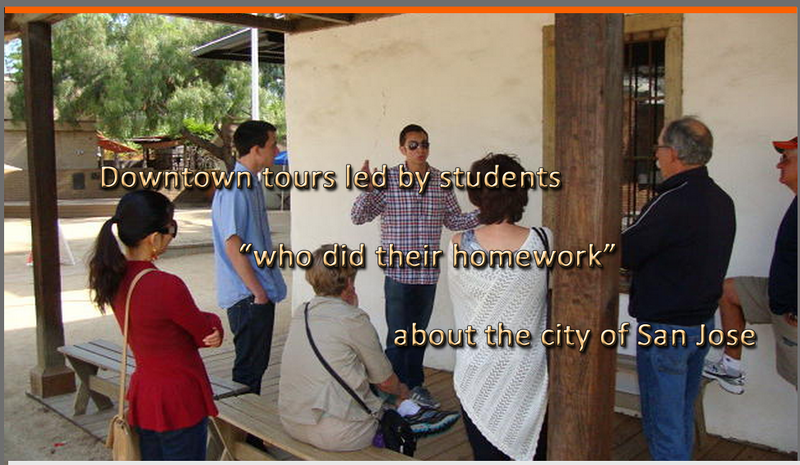 Our guides are local San Jose students who’ve done their homework about the city of San Jose. Our guests are local residents and a few tourists… just about anyone who enjoys a walk and a talk. If this weekend doesn’t fit into your schedule future tours can be booked in advance for your group, large or small, by contacting us at www.sanjosewalksandtalks.org Go to our contact page to email us directly and we’ll be back in touch right away. Our tours start in various neighborhoods downtown and are designed as a circular. Most tours cover somewhere between 2 to 3 miles and the starting location and time is sent to you by email confirmation. Public tours for individuals are currently free of charge but we hope if you enjoy the tour you’ll consider tipping the student guides. For private groups there is a nominal charge – contact us for more details.